Joe Yarkin - an icon in real estate - twinkles as he walks down memory lane and recalls the good old days in Palo Alto when our city was growing so rapidly. Palo Alto was a small town and Joe knew everyone! Originally from New York, Joe came to California to study economics at USC. After serving in World War II, he continued at USC, using the GI Bill to secure his Masters of Public Administration. Joe also met his wife Pearl, a fellow New Yorker, at USC while she was studying law there. After USC, Joe became a Coro Fellow and studied public policy in 1948. On a visit home to San Francisco with his college roommate, Joe, like many of us, fell in love with the area and decided to make his home here. The San Francisco area had more of the New York essence than Los Angeles. Joe was able to buy his first home in 1952 on Clara Drive on the GI Bill for $10,000. The contractor helped pay the closing costs; the mortgage was $70/month. Joe's daughter Kerry is now living in this first family home with her twins. Joe worked for the San Francisco Home Builders Association (HBA) and then became their representative in Santa Clara County. The HBA did public relations for the builders as well as wrote contracts for several of the crafts such as carpentry. This experience with the builders led him into real estate in 1957. As soon as Joe could get a brokers license, he went into business. Joe set up an office on El Camino near California Avenue where Joe's office was in the front half of the space and a plumbing shop was in the rear. The big czar of California Avenue at the time was Mike Golik - Mr. California Avenue. If you wanted something done, you talked to Mike. 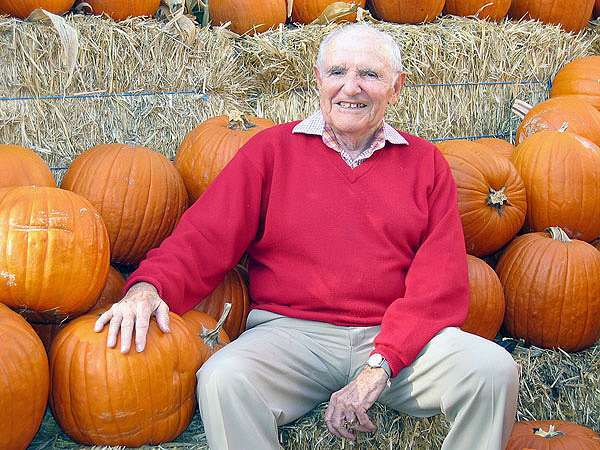 His family business was farming in Santa Clara Valley. For years, Joe and Mike had lunch once a week. In 1952, much of the land in south Palo Alto was truck farms. The city ended around Oregon Avenue; there were only a few small developments beyond that. There was a burst of growth in the 50's - mainly young families post GI - many who worked at Stanford or engineers who worked at companies like Lockheed. If you didn't work at Stanford or Lockheed you most likely commuted to San Francisco. Midtown was the BIG shopping center at the time. Joe fondly remembers the CoOp; he and Pearl belonged and shopped there till it closed. They loved Mitchell Park, and the schools were wonderful. His boys played little league. Joe was the boy's soccer coach. From residential properties, Joe gradually expanded into commercial buildings. After WW II, real estate attracted a lot of bright young men who grew Palo Alto. Most were in their late 20's, and were mainly veterans. They were a fiery bunch, Joe remembers. It was an exciting time, a good life and great way to make a living. He sold Palo Alto as a great place to live, convincing his clients to pay a bit more to live in a wonderful town with great schools. As the Yarkin family grew to seven children, they moved first to Tulip Lane to a home developed by Floyd Lowe, who was then the California Real Estate President. They then moved to Ely Place to a house that was big enough for the growing family. After the kids left, they found the perfect house in Menlo Park, where they still reside, although Joe still misses living in Palo Alto. His oldest son Alan is Managing Director for Smith Barney in South Florida. He is very athletic and still an avid surfer. Joe tried to carry a surf board once and that was enough surfing for him! Son, Mark has his own appraisal business in the East Bay. Son, Don works in the real estate business as a broker for Coldwell Banker in Palo Alto. Son, Burt is CEO for Cartridge World in the East Bay. Son Matt also lives in Palo Alto and works for a small computer company in San Jose. Daughter Neva always is currently living in Israel with two daughters and daughter Kerry now teaches third grade in Redwood City and has twins. In 1961, Joe was president of the Palo Alto Real Estate Board. He was active in the Jewish Community center on Arastedero for years and was on the board. Joe believes in giving back to the community. He has been a member of the local Kiwanis club for 35 years and still regularly goes to lunch for fellowship and excellent speakers. Joe was very involved in the downtown Farmer's Market and was on the committee for years. Joe still keeps a small office on Homer - near Whole Foods - where he can watch the comings and goings of the town he helped build. More favorite memories were of the key developers in Palo Alto at the time: Andy Oddstad was a developer, who built ranch style homes. He was unusual since he went to college - most developers worked their way up from the crafts. He built the Sterling Gardens Tract in 1951. Clara Street where Joe and Pearl bought their first home was named for the wife of Andres Oddstad and he named the cross street, Sandra Place, for his daughter. Sterham and Price did a big development on East Meadow and did many projects in Cupertino. Along side of them was Eichler- the most innovative. He hired first rate architects which was a rarity. Most of the others copied each other's styles or used draftsman (not architects). Joe Eichler made money in WWII in butter and eggs. He lived in a Frank Lloyd Wright house in Hillsborough. He liked it so much that he wanted to develop something similar for others. His first small development was in Sunnyvale, then he came to Palo Alto One of his first projects he did was in Barron Park. Shen and Allen were the architects. Another was in the circles in Fairmeadow. Joe got to know Eichler well, and said he was a real character. Eichler always seemed to be scowling. He talked through the side of his mouth where a cigar dangled He had a reputation, if you liked his houses, he would give you the moon. Eichler had a sense of design. This is especially noted in Greenmeadow, where he built the development with a community center and pool. And in Edgewood Shopping center - the only shopping center that he built. These young folks were very attracted to the Eichler homes with radiant heat. He couldn't build houses fast enough. Eichler had his biggest success in Palo Alto. In some cities such as San Francisco, he couldn't compete with the local builders. He flopped and lost his shirt. Joe remembers some of his most famous clients - from the Fairchild days. Eight young men were working on a vacuum tube project for Shockley. They were courted by Fairchild to start a business. A number of them lived in Midtown, and Joe sold them homes. Jules Banks and Gene Kleiner bought on Charleston Road. Robert Noyce later started Intel. They all later went on to do marvelous things. Joe also remembers selling many properties to Andrew Grove and his family. Andrew was always very thorough. His wife claimed that Joe was their good luck charm, since they were so pleased with every property Joe sold them - including their dream home where they still live.